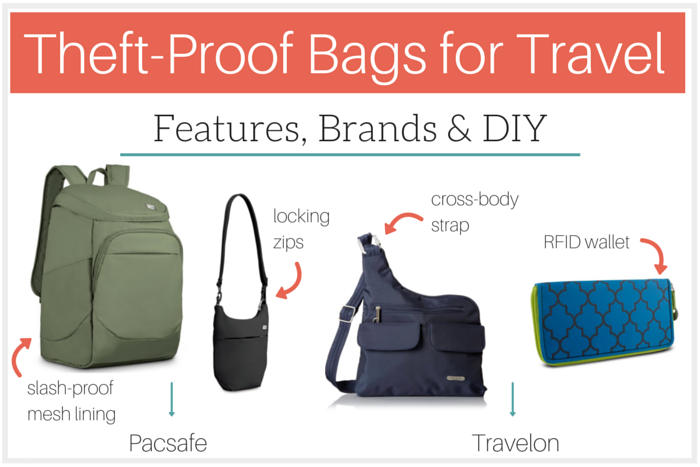 Theft Proof Bags for Travel: Do I Need One? One popular item for travelers visiting destinations that are prone to pickpocketing and theft is a purse or bag that has special features to prevent it. Tourist areas in Europe and beyond are full of pickpockets, especially in crowded attractions. I certainly considered them when planning my trip to Southeast Asia, which is known for bag slashings, even when you’re riding in a tuk tuk. So what do you need to know about theft proof bags for travel? Are they worth the splurge and do you need one at all? What types are on the market? We’ll discuss here. What Does a Theft Proof Bag Entail? A theft proof bag is typically one marketed towards travelers for its ability to prevent, or at least delay, theft. For a purse, it could be a cross body with secret pockets. The straps might be metal mesh lined to prevent slashing or they have RFID pockets to prevent the scanning of your passport and credit cards. What Are Important Features to Have? It’s easy to get caught up in all the bells and whistles, but there are only a few features that your theft proof bag actually needs to have. The first is zippers or some sort of closure. Most crimes are crimes of convenience when travelers leave their open bags out of sight. It’s also nice to have a carabiner or clip for your zipper so that someone can’t come up to you and pull on it. Guest blogger Kristin found this out firsthand while traveling in Portugal. Hidden compartments are also a good idea, as someone has to really rifle through your bag to find your wallet and important documents. And while not essential, a detachable strap that can be looped around a table leg or your train seat gives you additional peace of mind. Are There Downsides to Theft Proof Bags? One important thing to think about is your safety. You don’t want to be seriously hurt because you refused to give up your bag to a criminal. Is it really worth what’s inside if your life is on the line? The other downside to theft proof bags is the cost, as they are usually more expensive than your standard purse because of the various features they offer. Brooke’s Pacsafe Slingsafe 300 GII as worn in the Forbidden City, crossing the border from K-stan to China, in Urumqi, and hiking in Cappadocia. What Brands Make Theft Proof Bags? But with these in mind, be sure to read reviews, as some held up better than others. My sister’s Travelon React didn’t last through our trip through Thailand, but my PacSafe Slingsafe has now been to half a dozen countries with me. There’s something to be said for choosing quality over low cost. If the price of theft proof bags has you worried (averaging $40+ minimum), fear not. You can replicate some of the features with purses or bags you already have at home. First of all, make sure the bag in question is either a backpack or cross body, as one shoulder bags are easy to pull off you. You can also create zippers that are difficult to open by attaching a carabiner, keyring or safety pin to keep them together or attach them to the strap. Keep a fake wallet on hand in an outer pocket that you can throw at a potential thief. Fill it with those fake credit cards you’re always getting in the mail and a few small bills. And if you’re worried about having your card information stolen over RFID, you can purchase an RFID blocking wallet for about $20 on Amazon! Do you have a preferred theft-proof bag for travel? Or how do you keep your valuables safe when traveling? We leave on our year-long trip in two days. I took the plunge and purchased the PacSafe Citysafe LS75 anti-theft cross body travel bag. It was expensive but I like the features including the locking zippers, anti-slash fabric and cross body strap. I have been using it for a month now to get used to its size and compartments. I think it will work well. I can carry my iPad mini with its keyboard as well as all of the other usual purse things. I use a normal backpack with caribiners attached to the zippers, and so far that has worked really well in Europe! I also wrapped my emergency credit card in aluminum foil. As apocalyptic as that sounds, it works just as well as an RFID blocking wallet for so much less! There are also scarves with pockets that you can put valuables in. Came in handy when travelling on tours.